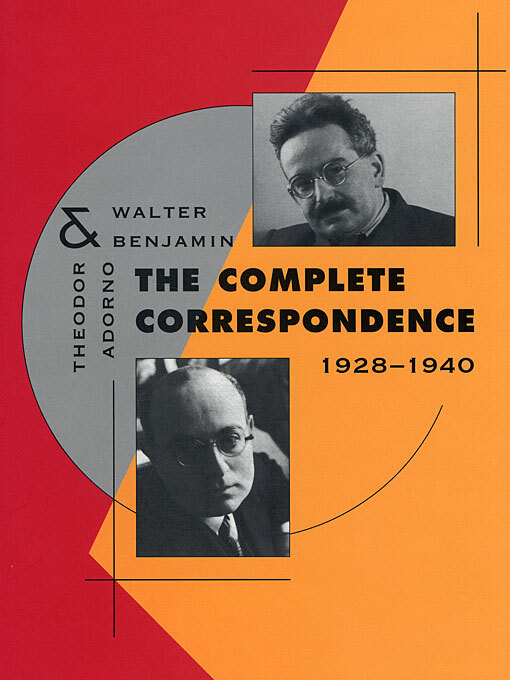 The correspondence between Walter Benjamin and Theodor Adorno, which appears here for the first time in its entirety in English translation, must rank among the most significant to have come down to us from that notable age of barbarism, the twentieth century. Benjamin and Adorno formed a uniquely powerful pair. Benjamin, riddle-like in his personality and given to tactical evasion, and Adorno, full of his own importance, alternately support and compete with each other throughout the correspondence, until its imminent tragic end becomes apparent to both writers. Each had met his match, and happily, in the other. This book is the story of an elective affinity. Adorno was the only person who managed to sustain an intimate intellectual relationship with Benjamin for nearly twenty years. No one else, not even Gershom Scholem, coaxed so much out of Benjamin. The more than one hundred letters in this book will allow readers to trace the developing character of Benjamin’s and Adorno’s attitudes toward each other and toward their many friends. When this book appeared in German, it caused a sensation because it includes passages previously excised from other German editions of the letters—passages in which the two friends celebrate their own intimacy with frank remarks about other people. Ideas presented elliptically in the theoretical writings are set forth here with much greater clarity. Not least, the letters provide material crucial for understanding the genesis of Benjamin’s Arcades Project.